Boston suffers an 8-5 defeat and now has its longest losing streak since 1994. ST. PETERSBURG, Fla. — Stuck in their longest skid in 20 years, the Boston Red Sox didn’t like the way they played. They didn’t appreciate how the Tampa Bay Rays acted, either. The World Series champions lost their 10th straight game and brawled with the Rays during an 8-5 defeat Sunday. Rays pinch hitter Sean Rodriguez connected for a tiebreaking, three-run homer in the seventh. Later in the inning, Yunel Escobar hit a two-run double and then took third on defensive indifference, setting off the fracas. “Yunel is going to do some things that might be a little unpredictable, so that’s what precipitated it,” said Farrell, who formerly managed Escobar in Toronto. 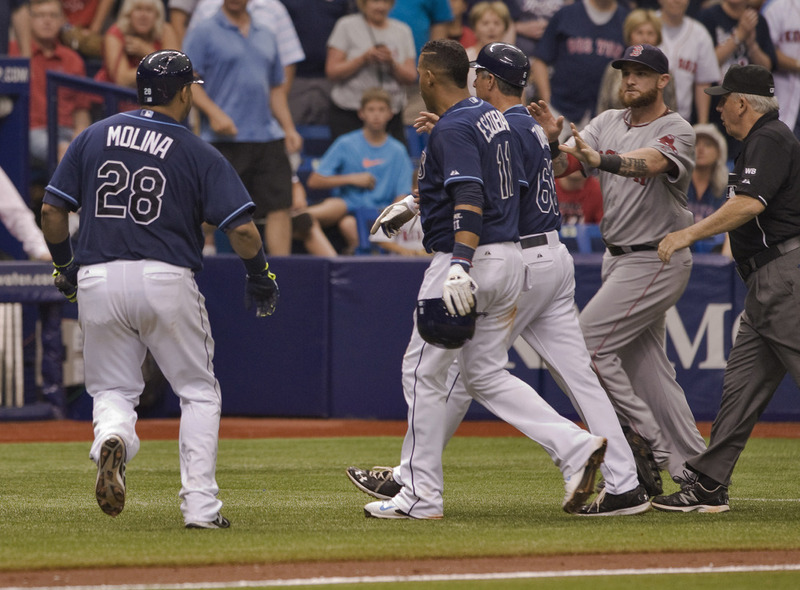 Escobar, Rodriguez and Boston’s Jonny Gomes were all ejected. Rays Manager Joe Maddon didn’t quite agree with Farrell’s assessment of baseball’s unwritten rules. “Before you start screaming about any of that, just understand what happened just last year, and also understand in this ballpark, five-run leads can evaporate very quickly,” he said. This is Boston’s longest losing streak since an 11-game slump from June 8-19, 1994. The Red Sox have been outscored 52-24 over their last 10 games. World Series MVP David Ortiz is hitting .118 and has no RBI in that span. Boston will try to end the drought Monday afternoon when it plays at Atlanta. Xander Bogaerts hit a two-run single with two outs in the Boston ninth off Josh Lueke. Grant Balfour got his ninth save by retiring Pedroia on a grounder. Gomes pulled Boston even at 3 with a two-run, pinch-hit homer in the seventh off Joel Peralta (2-3). After Craig Breslow (2-1) walked pinch-hitter Desmond Jennings and gave up Evan Longoria’s single to start the seventh, Rodriguez gave the Rays a 6-3 advantage. Later in the inning, Escobar doubled and easily took third without a throw on the first pitch to Jose Molina. Escobar got into a yelling match with players in the Boston dugout and had to be restrained just before both benches and bullpens emptied. The sides gathered around third base for a short session that mostly involved pushing and shoving. Longoria hit a leadoff homer and Logan Forsythe had an RBI single as the Rays took a 2-1 lead in the fourth. Wil Myers made it 3-1 on a run-scoring grounder in the fifth. Brandon Workman, recalled from Triple-A Pawtucket before the game, gave up three runs and five hits over five innings in his first big league start this season. He made three relief appearances with Boston earlier this year. Rays starter Jake Odorizzi allowed one run and four hits in six innings. NOTES: Rays RHP Jeremy Hellickson (arthroscopic right elbow surgery) threw batting practice and is set to pitch in a simulated game Wednesday. He expects to return before the All-Star break. … Farrell said Ortiz will play first base in at least once in the two-game interleague series against the Braves.